A Three-Gallery Night: Dogwood Arts 2014 | Oh, the Places We See . . . It was a night of openings at three galleries celebrating that important middle word in Knoxville’s Dogwood Arts Festival: ARTS. On a warm spring evening — April 11 — patrons headed to the galleries to view creative pieces by some of the best-known (and some unknown until now) artists in the area. 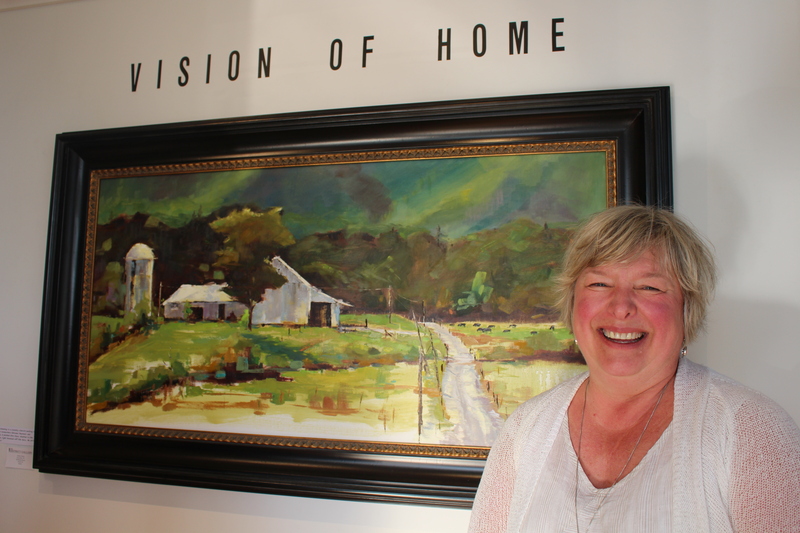 Combining that Open-House-kinda-feel with well-crafted, original art, the Featured Art Exhibits kicked off the 2014 season of honoring artistic creativity in East Tennessee. The featured artist of the Dogwood Arts Festival, Kathie Odom was on hand at The District Gallery. Her painting, Sycamore Row, was selected as the 2014 Limited Edition Print. After graduating from the University of Tennessee, Kathie distinguished herself as a pastel artist in the 1982 Dogwood Arts Festival. But in 2009, she began working in a new medium: oils. Her subject matter is influenced by the rural landscapes she loves with nostalgic scenes of barns, sheds, fields, and trees changing with the seasons. Notes hand written by the artist were posted next to each painting, providing personal insight into what had inspired her to create each painting. Renda Burkhart talks to Kathie Odom about the paintings. 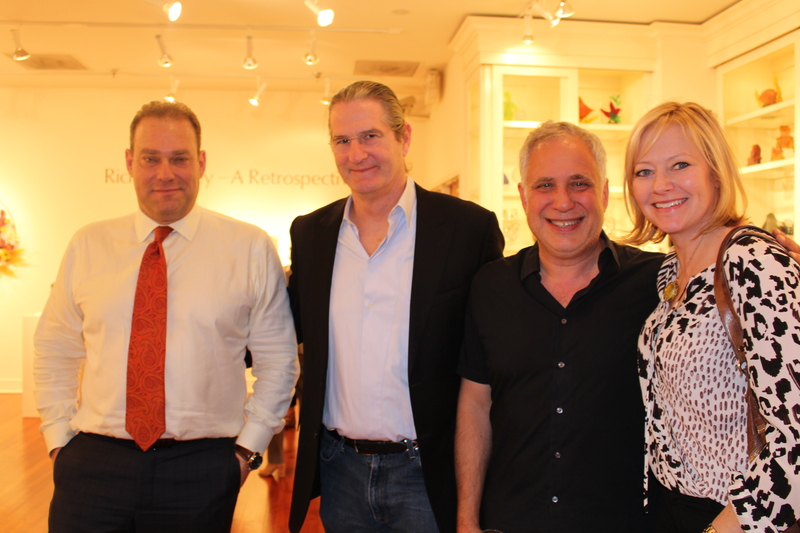 Attending the Opening Reception at Bennett Galleries: Don Bosch, Richard Jolley (featured artist), Ashley Capps, and Maureen Bosch. In conjunction with the unveiling of the largest glass installation in the U. S. at the Knoxville Museum of Art — The Cycle of Life, Within the Power of Dreams and the Wonder of Infinity by Richard Jolley — Bennett Galleries opened a retrospective of work revealing the stages of Jolley’s career. Born in 1952 in Wichita, Kansas, Richard Jolley, now known as a glass master, was raised in Oak Ridge and studied at Tusculum College (Greenville, TN), George Peabody College (Nashville, TN) and Penland School of Crafts (Penland, NC). Maintaining a glass studio in Knoxville since 1975, Jolley has been heralded around the world for his creativity and unique style. More than 65 public and private exhibitions and 33 collections boast at least one glass creation by Richard Jolley. A huge crowd of supporters at Opening Night at Bennett Galleries gathered to talk with the artist about the pieces on display and the upcoming reveal at Knoxville’s Museum of Art. Margie Nichols and John Gill stand by “Contemplation” (hot formed glass and metal) by Richard Jolley. Larry Gabbard explains his unusual techniques (adding horse hair and sugar, for example) to create one-of-a kind pottery pieces. Members of the Foothills Craft Guild were honored guests at the 2nd annual Fountain City Art Exhibit located at the home of the Fountain City Art Center. Works from Foothills members will be on display and on sale through May 9. Foothills Craft Guild is known for fine craftmanship and unique creations. Applicants for membership in the guild must reside in Tennessee and submit original work for jurying. 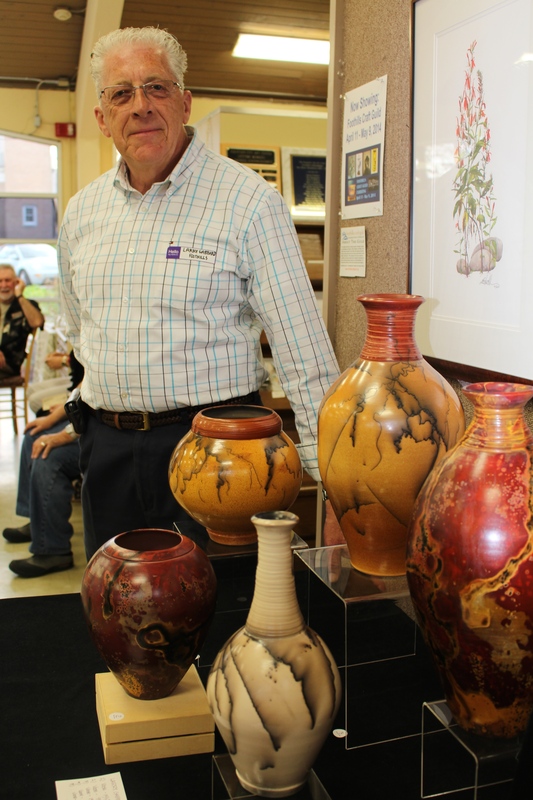 On Opening Night of the Foothills Craft Guild Spring Exhibit, members of the guild were on hand to talk to guests and explain the processes used in creating the pieces on display. A night for art. A night for crafts. And an interesting first look at Knoxville’s 2014 artsy side! This entry was posted in Festivals, Tennessee and tagged art glass, Bennett Galleries, Dogwood Arts Festival, Foothills Craft Guild, Fountain City Art Center, Kathie Odom, oil painting, pottery, Richard Jolley, The District Gallery. Bookmark the permalink. It was good. I was on “Art Overload” and lovin’ it! So many pretty things, so little time to get to all the galleries! Thanks for reading! Beautiful art works! Thank you so much for the tour, Rusha! You’re quite welcome! I loved seeing all the art this year. It really was a wonderful night. Everyone was happy, and food/wine made the evening even more special. Not to mention the unique art! Thanks for reading. A plethora of WOWs! What a talented group of artists in your area! We really do have a lot of talented artists here — and in surrounding areas. Some paint from the beauty of the area. Others just have that creative bent, I guess. So come on down and see us! Thanks for reading.